On Monday there’s a talk organised by the BCS about the Enigma code breaking efforts during World War II – detail @ http://nottmderby.bcs.org/events09-sep.php (plus there’s a chance to have a go on an original Enigma). 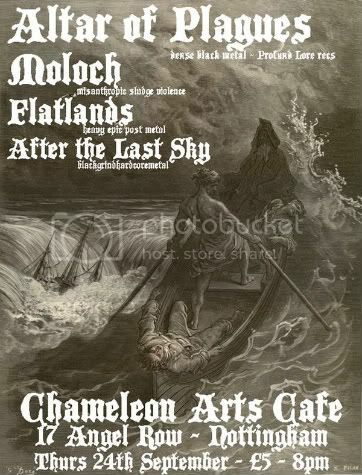 And it’s at Chameleon Arts Cafe, which I’ve never been to. So hopefully rectify that one on Thursday. Apparently it’s above the clinton cards on Angel Row. And then on Sunday another Torturous promotions Gig rears it’s head, Middenhelm+The Atrocity Exhibit+Pure Negative+Anger Management @ The Old Angel in Nottingham. As part of their “To Victory” tour, Middenhelm and The Atrocity Exhibit are coming to Nottinghams’ Old Angel. Middenhelm were due to play Damaged Stock, but had to pull out at the last minute due to illness. If you were looking forward to watching them, this is the perfect opportunity to catch them in action!